Before we delve into the code level implementation details let's briefly understand a few concepts related to JWT. As mentioned earlier JWT stands for JSON Web Tokens. It's an open standard to pass user data between client and server. JWT has many advantages over traditional cookie authentication. JWT is more secure and can also be used with non-browser clients. JWT is a prefferred choice for implementing authentication in Single Page Applications (SPA). A JWT token consists of three parts namely header, payload, and signature. You will learn about them in the later part of this article. Client sends security credentials such as user name and password to the server for validation. Server validates the user name and password. If found correct the server generates and issues a JWT token to the client. The client receives the token and stores it somewhere. While requesting any resource or action from the server, the client adds the JWT token issued earlier in the Authorization header. Server reads the authorization header to retrieve the JWT token. So, simply put JWT acts like a ticket. If the incoming request has a ticket, it is allowed to access a resource. Store JWT details in a configuration file. Enable JWT authentication scheme in the application startup. Create some mechanism that validates user name and password, and issues a JWT. Let's perform these steps one-by-one. 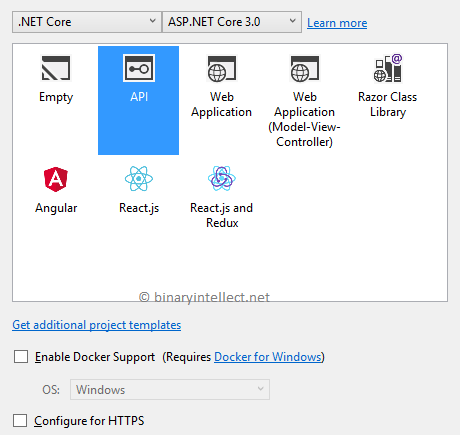 Begin by creating a new ASP.NET Core API project. Notice that I am using Visual Studio 2019 and ASP.NET Core 3.0 but you can use Visual Studio 2017 and ASP.NET Core 2.2 also. Of course, the section name need not be Jwt. You can give any name of your choice. The Jwt section defines three keys - Key, Issuer, and Audience. The Key is supposed to be a secret string that is used while signing the token. Issuer indicates the party that is issuing the JWT and audience indicates the intended recipients of the JWT. We call AddAuthentication() and specify JWT bearer scheme to be the authentication scheme. We also specify various options for the JWT bearer scheme. If you carefully observe the TokenValidationParameters object you will find that it indicates whether issuer, audience, lifetime, and signature key is to be validated or not. Additionally we also specify a valid issuer, a valid audience, and a valid signing key. These values are retrieved from the configuration file. We call UseAuthentication() to wire the authentication middleware into the HTTP pipeline. We need some mechanism that validates a user name and password. We will go with an API that does that for us. So, add a new API controller called SecurityController in the Controllers folder. The SecurityController will have two private helper methods and a public action. The above code retrieves the issuer, audience, and key from the configuration file. It then creates a new SymmetricSecurityKey based on the Key. SigningCredentials object is then generated based on the SymmetricSecurityKey. Notice that we use HS256 algorithm while generating the digital signature. Now we can move ahead and create a JWT token. This is done using JwtSecurityToken class. We pass the issuer, audience, an expiry DateTime for the token, and the signing credentials in the constructor. We want the JWT in a string form so that it can be easily sent to the client. This is done using JwtSecurityTokenHandler class. 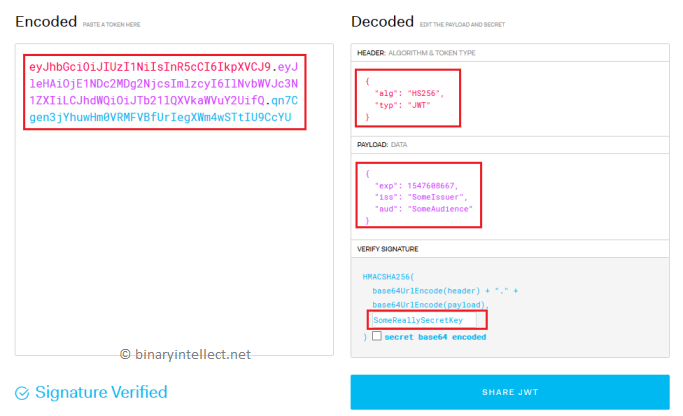 The WriteToken() method accepts a JwtSecurityToken created earlier and returns it as a JSON compact serialized format string. Inside, it checks the user name and password. In the above example, we simply check against hard-coded values. But you could use ASP.NET Core Identity or any custom technique to validate a user. If the user credentials are valid we return true, otherwise we return false. 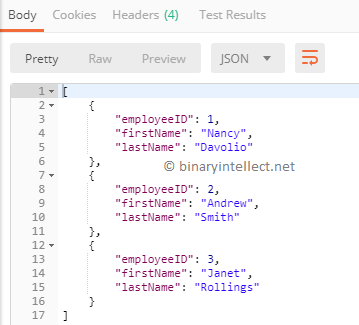 Instead of returning true you could have also returned user details such as user name and roles. Here, for the sake of simplicity we don't return any such details. Finally, we need Login() action that will invoke ValidateUser() and GenerateJWT() helper methods. Note that Login() action of SecurityController is marked with [HttpPost] attribute. It accepts User object as the parameter. The Login() action will be invoked by the client application and the client, by some means, will supply the User details such as user name and password. Inside, we call ValidateUser() helper method to check whether the user name and password are valid. If user credentials are valid, we call GenerateJWT() to generate a JWT token. The string token is returned to the client with HTTP status of Ok (status code - 200). Before we go ahead let's quickly test our Login() action. 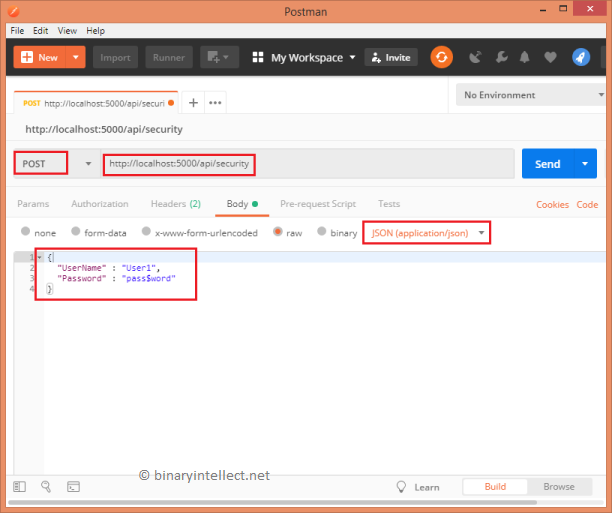 Run the API project either through Visual Studio or using .NET CLI. 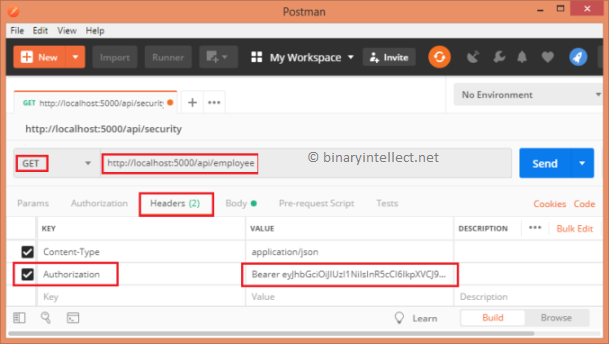 Start Postman and enter URL as http://localhost:5000/api/security. Make sure to select the HTTP verb to be POST. And also specify the JSON body that wraps UserName and Password as shown above. This is the JWT token! Notice that the token takes the form of -- header.payload.signature. Ok. Now let's see what's the actual content of this token. Have a look at the header and payload. Ok. So far so good. Now let's create an API that requires security. Add another API in the Controllers folder - EmployeeController. For the sake of simplicity we will have only GET method in it. What's important is that this method is marked with [Authorize] attribute. The [Authorize] attribute indicates that only authenticated users can invoke Get() action. Let's confirm whether it works that way or now. Open man tool again. This time make a GET request to http://localhost:5000/api/employee. Recollect that under JWT based security, the client needs to explicitly send the token to the server through Authorization header. So, while making the GET request we need to add the Authorization header and set its value to the JWT token we generated earlier. To add the authorization header, go to Headers tab and enter KEY as Authorization and VALUE as Beader <string_token_here>. Notice that it's Bearer, followed by a white space, followed by the actual token. Now click on Send button. If all goes well, you should see a list of employees.